There has been no reason to post about Glenn Beck in connection with the apparently insane assassin in Tuson, AZ. What the lead sheriff in the investigation said about the vitriolic language on the radio and television certainly applied to Mr. Beck among others, but that did not warrant mention on this critical Review and analysis. However, now Mr. Beck has defended partial Governor Palin, winner of this year's Glenn Beck Honorary Excellence in Misinformation Award. Palin, who like Beck is a deceitful reactionary and, thus Beck's political ally. Since Mrs. Palin incorporates the language and symbols of weapons into political discourse, she has come under criticism. Listen to Beck's argument. The following clip comes to the Review from the media blog, Mediaite. There are a number of falsehoods in this rant. Beck likes to claim that he would be fired for making falsehoods, but Beck routinely makes false claims, some of them whoppers, without any repercussions from Fox. At the end Beck reminds people that he was on CNN, but unlike MSNBC, CNN is hardly a "liberal bastion," especially when Beck was there. Highly opinionated, conservative Lou Dobbs ran the nightly news hour for CNN at the time. Beck claims that Fox "didn't engage in wild speculation" about the motive behind the killer's actions, but Fox news correspondent, Jennifer Griffen, did report on a memo that "possibly linked" Loughner to the anti-immigration group, American Renaissance. There is the question of Beck's violent rhetoric. Despite his calls for non-violence, Beck has inspired one of his followers to go on a shooting rampage that was fortunately cut short by the CA Highway Patrol. Beck is naive if he honestly believes that telling his audience, made up of many fundamentalist and evangelical Christians, that the President is comparable to Lucifer does not put the President at increased risk from someone gullible enough to believe such nonsense and act on it. I denounce violent threats and calls for the destruction of our system -- regardless of their underlying ideology -- whether they come from the Hutaree Militia or Frances Fox Piven. Denouncing violence is clearly a good thing in a democratic society. Unfortunately, Beck made no pledge to stop the violent tone of his own rhetoric. There are many examples of his alarming hyperbole and unadulterated hatred from the last two years of his show on Fox. It's bad enough to have been virtually inciting violence and sedition against the Obama-led government routinely on his show and literally inspiring one of his ardent supporters to go on a killing spree last year. However, this week, when the country is shocked at the violence and many critics are pointing at those in the media, who have incorporated symbols and language of weaponry into their political language (Gov. 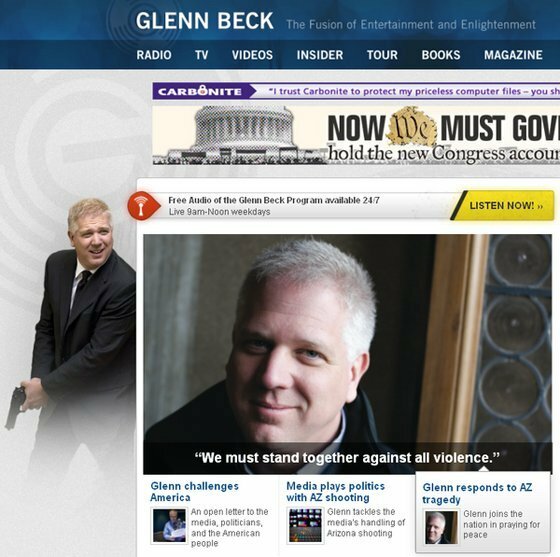 Palin's "Don't retreat, reload" for example), Beck absurdly juxtaposes on his website his call to "stand together against violence" with a photo of him holding a handgun as if in battle, perhaps hunting progressives. Is this obvious contradiction hypocrisy or just sheer stupidity? We must stand together against violence. Once common sense way to do this is to severely restrict the ownership of weapons, perhaps even to ban the sale of assault weapons and the extended bullet magazines like the ones used in this killing spree. Beck, of course is dead set against this and falsely claimed that politicians are calling for a "ban on guns." Actually, this habitual liar went even further on his Fox show of 1/11/11: "Politicians, however, are there to protect you, and they're pushing a ban on certain symbols and words, a ban on guns, a ban on talk radio." Who is calling for a ban on talk radio? No one, of course. Part of Beck's paranoid style is to routinely stoke fears in his listeners. Fear is not a rational emotion. When Beck repeatedly stokes fears, creates images of a coming apocalypse caused by the President day after day and worse, associating the President of the United States with Lucifer, Glenn Beck crosses the line from responsible and loyal opposition and dissent against government policies to appalling, dangerous and irresponsible propaganda. We must all stand together against the rhetoric and imagery that blends weapons and political discourse. We, people of good will, reason, rationality and Constitutional principles, must stand against Glenn Beck.